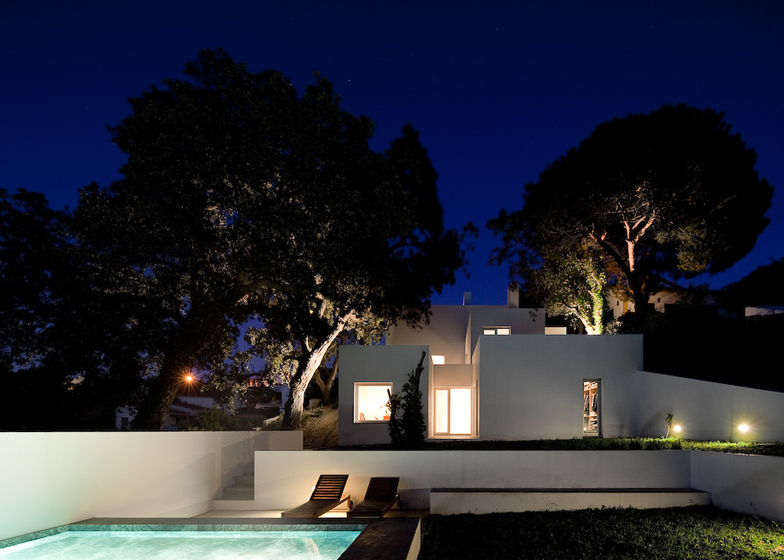 Portuguese studio DNSJ.arq has completed a cluster of three white houses on the outskirts of a small town in southern Portugal (+ slideshow). Located just outside Aldeia do Meco, the first of the three houses was designed by DNSJ.arq as a home for the clients, while the other two function as rentable holiday homes. Two of the houses are located on a flat section of the site close to the street and the third house is positioned behind them, slightly further up the hill. 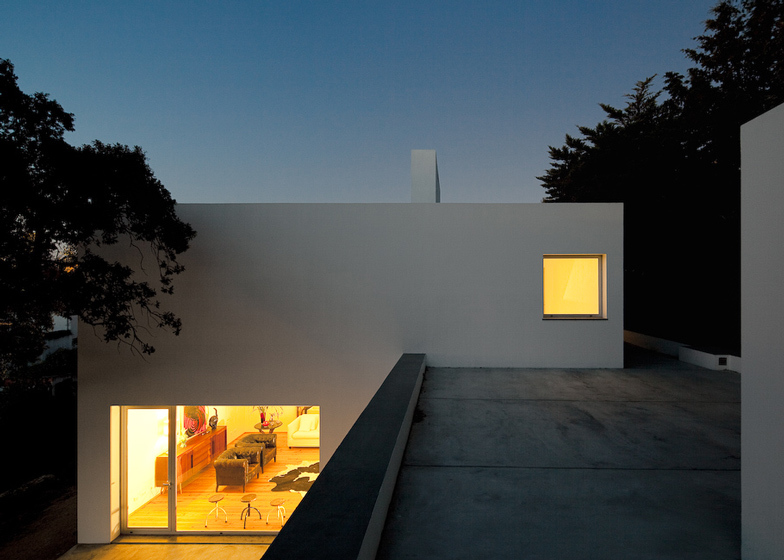 Architect Nuno Simões said the team decided to arrange each house in a different composition, "almost like a jazz improvisation." 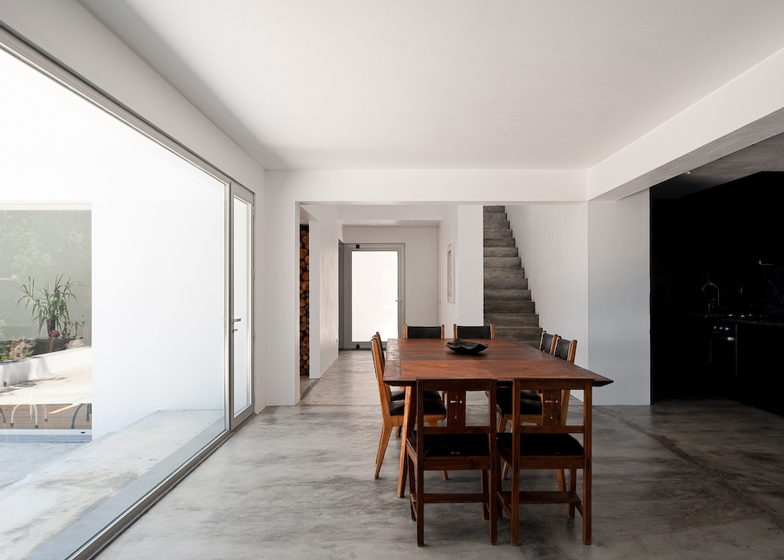 "We decided to make the bigger house for our client - in the hilly side of the land with the swimming pool - and the other smaller two for rent," Simões told Dezeen. "The two smaller houses, which have a more congested situation, were for living mainly on the patios, while the larger house faces a small river with a glimpse of the ocean," he added. 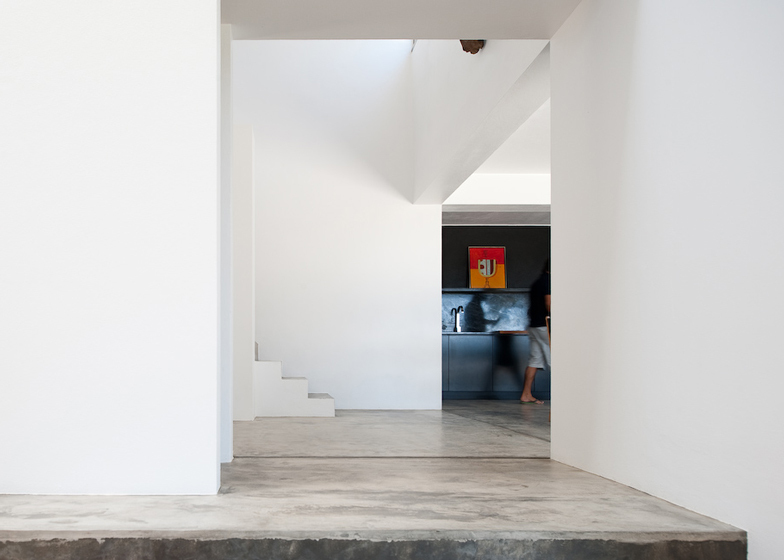 Each house has brick walls that coated with white render, as well as poured concrete floors. All three open out to patios on two levels and feature their own private swimming pools. A garage connects the two smaller houses. A pathway leads to the third house, which is twice as big and boasts more bedrooms and a spacious kitchen. The intervention that is proposed is located within the urban perimeter of Aldeia do Meco. It is a narrow strip towards sunrise/sunset, flat up to about half of the land and thereafter acquiring an pending until the river bordering the west. The settlement program includes the construction of three houses, two for rent and a residence for the owners. The first two houses are grouped together (Casa 1 and Casa 2) on the flat part and closer to the street and settled the other house (Casa 3) on the ground to the west. 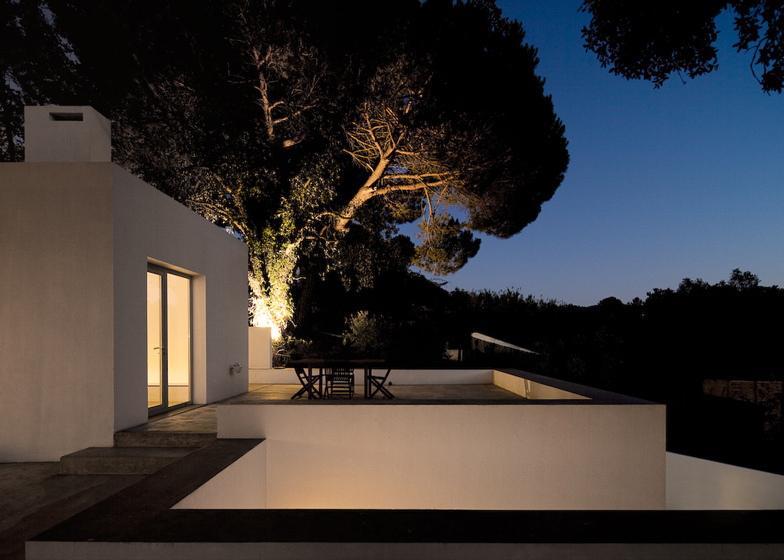 This house adapts to the topography, adjusting to the presence of existing trees, and enjoying the views through a system of terraces that extend the house outdoors. Unlike Casa 3, Casa 1 and Casa 2, more exposed to neighbouring buildings, enjoy a more intimate relationship generated by a system of courtyards. 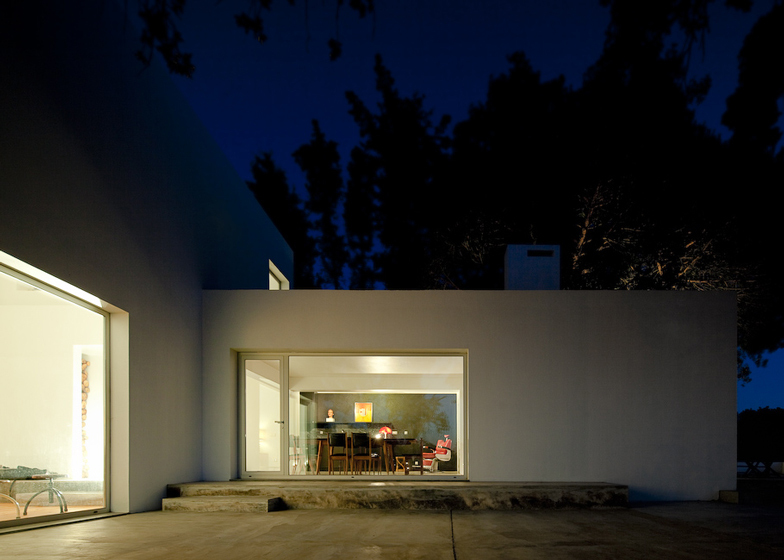 Important starting point was the impossibility of any sophistication constructive opting for current building systems. The banality of the building grew into a minimal architectural lexicon composed of white unequal volumes, but similar in nature. This game was complemented with the austerity of the chosen materials.